Relax by the wood burner, walk down the garden path to the Glen Eden river and admire the Tui, Kereru and Fantail in the established trees. Located just beside our historic school house, the cottage is private and super comfortable with quirky decor and artwork throughout and garden views from every room. 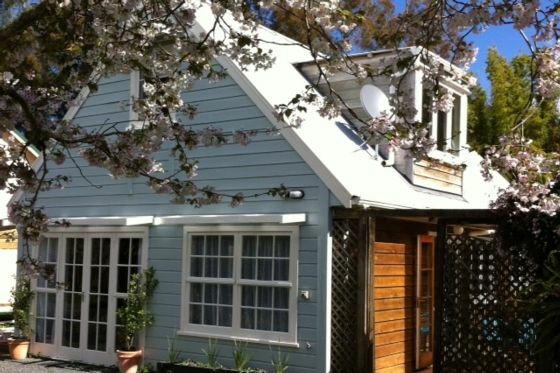 Just around the corner you'll find Charlies Gelato garden, the Matakana markets and superb cinema, The pub, Samill Brewery, Ascension Wine Estate and much more. Minutes from Omaha beach, Tawharanui and Goat Island marine reserve. Perfect retreat from the city with private access to the river and use of our kayaks. We also have a divine vintage and homewares shop on-site. We provide a selection of tea/coffee/milk/cereal. Come and rejuvenate at a little corner of paradise. 2 night minimum applies at all times. We have lots of animals on the property including our 3 pet dogs. They are very friendly but if you don’t like dogs, this is not the place for you. If you have a chicken phobia (it's a real thing), it’s gonna be a looong weekend!! Also if you can't manage loft-type stairs (they are a little steep but perfectly formed), it may not be the place for you. Extras: Linen (included); NOTE: Under Kiwi bach tradition you are expected to: do the dishes before you leave. Hadee and Craig were super welcoming as were Moss, Louie and Daisy--the dogs at the "Ponderosa". The photos don't do the place justice in both spaciousness and beautiful decor. Everything you need is there and everything is clean. The spot down by the river is a wee paradise. Communication was great throughout. We would definitely come back. Thanks for having us. We would love to have you back anytime Antje. Enjoy your time with your gorgeous parents. Had a great time, wish we could have stayed longer. An absolute dream. The house is perfect for curling up in front of the fire with a book or a game (all supplied!). The property is beautiful - the swing by the river, curious chickens, and we loved the alpacas. The stairs in the house are safe and well-built, the kitchen is well-equipped and we loved the treats in the fridge. We will absolutely be back in the warmer months to take the kayaks out. Can’t recommend highly enough. We loved our stay at Haidee's cottage. We loved our stay at Haidee's cottage. The cottage was lovely inside and warm and cosy by the fire in the evening. The cottage is set on a large property with lovely nikau palm entrance, fruit trees, etc and we loved the alpacas, cow and hens. The cottage is in a great location to the township and surrounding districts, beaches and arty things to see. Totally recommend as a place to stay to enjoy all that the Matakana area has to offer.